Risotto is truly a labor of love, requiring constant monitoring and frequent stirring. But it's a favorite Italian comfort food, truly worth the effort. In this recipe, earthy chanterelles pair with the bright taste of greens to complement the creamy rice. Any greens that are in season will work, but in the spring, something like watercress or sorrel would offer a fresh flavor. This recipe can be made the conventional way, in a saucier or saucepan. But if you want to give your stirring arm a break, try making this in one of the do-it-all appliances on the market like the Kenwood Cooking Chef, the Tfal Actifry, and the KitchenAid Precise Heat Mixing Bowl. With a heating element and a stirring mechanism, they'll do all the work for you, leaving you free to do other tasks in the kitchen. Cooking Equipment Needed: Liquid measuring cup, chef's knife, cutting board, measuring cup, cheese grater, saucepan, saucier or cooking machine. In a saucepan on the stove, bring the chicken stock to a simmer and keep hot. In a saucier pan, add butter over medium heat and allow it to melt. When the butter is melted, add the onion and cook until the onions are translucent, about 5 minutes. Add the chanterelles to the pan and cook 3 to 4 minutes, until they begin to soften. Add the rice and cook for 3 minutes. Add the vermouth or wine and cook until nearly all of the liquid has been absorbed, about 4 minutes. Add 1 1/2 cups of the hot stock and cook until the liquid is nearly absorbed, about 10 to 13 minutes. Continue to add stock, 1/2 cup at a time, allowing it to absorb before adding more. When all of the stock has been added and the rice is creamy and firm to the bite but cooked through, stir in the greens and the Parmesan cheese, using a spoon to fold the greens and cheese into the rice mixture. Cook for 1 minute more until the greens wilt and the cheese melts. Season to taste with salt and pepper. 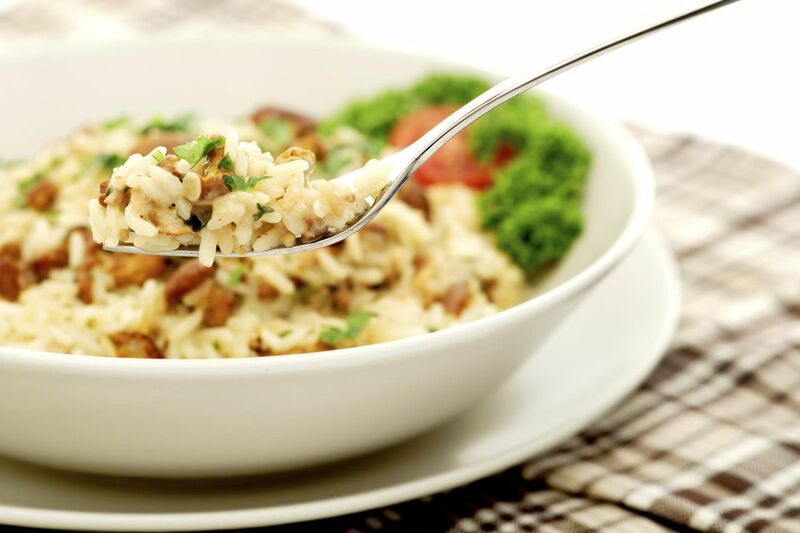 To serve, portion the risotto into bowls and sprinkle with additional Parmesan cheese. Looking for the best steak recipe? Get our free cookbook when you sign up for our newsletter.